There is nothing quite like following a football team away. At home matches you get a hodge-podge crowd of enthusiastic supporters, families on a day out, corporate season ticket holders with nothing better to do, football hipsters, casual fans who come to one or two games a year, and youth soccer teams with a block of tickets. Although the atmosphere at a home game, given the right circumstances, can be good, there is nothing like an away crowd. To follow a team on the road you have to be committed, and just slightly insane. In North America in particular, with great distances between MLS cities, it takes a combination of commitment, passion, madness, and money to go on an away trip. In Toronto for example, with our closest road trip to Montreal being a little over a five hour drive and with any of our trips to the US requiring at least a six or seven hour drive on top of a border crossing, you're looking at staying overnight in a hotel somewhere. Despite it all though, when you arrive at your destination and if there are a fair few number of your teams fans that have made the trip it's all worth it. The atmosphere at away matches is second to none, and besides the match the whole day is usually an event as you invade local bars, perhaps have a tailgate, and then passionately support your team in a hostile town. With Toronto FC, in the first four seasons at least, a huge number of fans would hit the road when the team was playing on the east coast. The Columbus away trips in particular were popular with TFC supporters as it was our closest geographical rival, prior to Montreal coming into the league, and the Crew would generally allocate plenty of tickets for our fans. In 2008, for the season opener, over 2400 TFC fans made the trip down to Ohio and there were close to 2000 again in March of the following year. That 2009 roadtrip to Columbus was my first with TFC, and although I would do many more over the next few years it was always my favourite trip as my brother and nearly all of my close friends that I used to attend matches with came down to Ohio that year. We had a BBQ and drank an obscene amount of beer prior to the match, the noise in the stands was terrific, and we even secured a rare point on the road against the reigning MLS Cup holders. 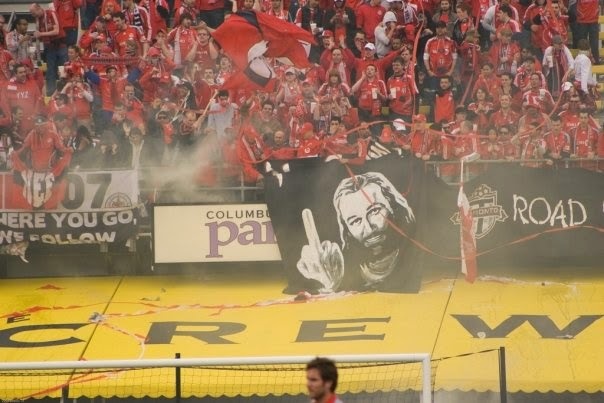 Before those of us that follow TFC were drained by all of the losing, management and player changes, in-fighting between supporters, price gouges, and inept decisions by ownership, supporting TFC back then at home, but particularly away, was an incredible amount of fun. After all the crap that's been dumped on TFC fans in the proceeding years it often seems like a foggy memory how great those early days were when we just happy to have a local team of our own to support. The team may, hopefully, start winning one day, but it's hard to imagine this buzz of those early years will ever come back.